The art performance or artistic performance is an interdisciplinary medium or artistic tradition, born around the middle of the 20th century, whose origins are related to the avant-garde movements. Performance is a way of appealing directly to the public, hitting the audience to re-evaluate their own understanding of life and its contributions to culture. Performative art, a mode of contemporary artistic expression or quasi-artistic forms of expression (Madeira, 2012), is the combined appearance of music, poetry, dance, theater, improvisation and their partner arts as joint appearance, in which the breaking with tradition clashes with habits and tradition, petrified into culture. This is the art of ideas, interaction between personality and objective environment, performers and spectator which, as a system of effect and counter effect, forces the re-evaluation of the audience’s ability to create public opinion (Goldberg, 1988). At the same time performance, while transcending social norms as a performing art form, is not irrevocably institutionalized and domesticated, the questions it forces are not answered (Szőke, 2000). The meaning of performance is also exploit, where the implementation and content must not lack the creative attitude. 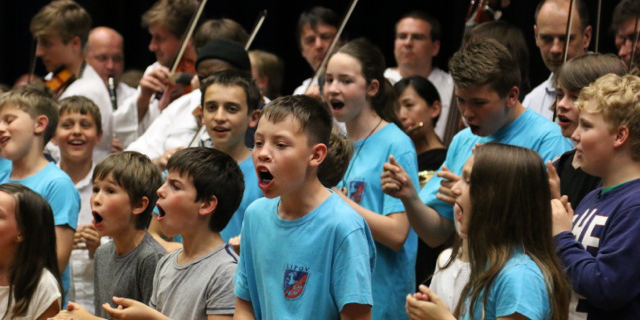 In the Musik kreativ+ program, with the objective of developing the creativity of students in school music lessons, there is a key role for the genre of performance. The primary aim of school performances by students and professional musicians in Musik kreativ+ is not the entertainment of the audience, rather the enhancement of creativity brought about by performance situations, practice and experimentation. This way the students will not get into a stress situation, which a traditional performance can cause, even though involuntarily, by the accompanying effect of stage and audience on each other. Thus, in the traditional sense, the audience here (if there is one) is not the usual as, in some cases, it is clearly shown by either designation of a place for the audience or its randomness. Performances, allowing the appearance of creativity beside the curriculum of Musik kreativ+, can be a proper way for the presentation and dissemination of the program’s results. They give form to the conception of the four countries and, as tests of certain of these ideas, prove their operability. At the same time they do not give final shape to the ideas; while inspiring, they can always be continued, leading to further experimentations. During the program the students are making creative performances, such as turning the noises of nature and environment into music and producing them with instruments or by voice; preparing a short movie, based on a given musical composition or parts of; shadow play with stage and musical performers; haiku, set to music with graphic notations; performance of folk music and folk dance; imitation of music and movement; instrumental, singing and movement improvisation; African and contemporary music synthesis; showing musical inspiration through image installation; making posters and placards. The length of performances, dictated by the availability of the time and age, also by the ability of concentration of the students, usually takes a few minutes but, depending on the chosen thematic and presentation technique, it can stretch from a few seconds to more than twenty minutes. Although the primary objective of performance experiments is not the public showing, but some of them – owing also to the presented technical elements – play an effective disseminating role (i.e. composition from the sounds of the street, short movies), thereby presenting the precise objective of Musik kreativ+. It is believed by the creators of these curricula that, through these examples as presented, also during the creation of similar performances, the creativity of the students in school music education can show significant development, making positive contribution to the efficiency of the learning process and the cognitive function and personality of young people. Szőke, Annamária (edit. ): A performance-művészet, Artpool – Balassi Kiadó – Tartóshullám, Budapest, 2000, p 7-12.